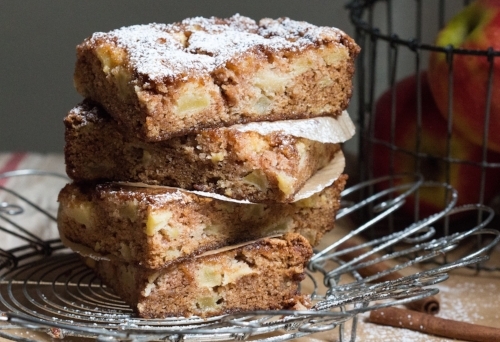 EASY Apple Snack Cake! ---YUM!! THERE ARE APPLES ALL OVER THE PLACE UP HERE this time of year. And of course, I have way too many apple recipes, and never enough time to make them all. So, I’m always conflicted over which of them to choose. This year I DECIDED TO KICK OFF THE SEASON WITH THIS VERY SIMPLE, YET VERY DELICIOUS CAKE. It’s sweet with lots of cinnamon and a hint of nutmeg. It’s the best way I can think of to bring out all of that apple-y flavor. It’s versatile too. You can serve it for breakfast or as an after-school snack. Or, it can easily be dressed up for dinner with a dollop of freshly whipped cream spiked with Apple Jack, and sprinkled with a dusting of cinnamon on top. I LIKE TO USE STURDY ROME’S, FUJI’S OR GRANNY SMITH’S. Don’t use more tender apples like Macintosh or Macoon, because they won’t hold their shape once baked. This is one of those dump and stir recipes where the hardest part is peeling and dicing the apples. Once that’s done though, you’re home free. I’m not a fan of a lot of oil in this cake, so I’VE REPLACED HALF THE OIL WITH APPLESAUCE, BUT YOU’LL NEVER NOTICE. This is a great cake to take to any fall get together. YUM! 1. Cut all the apples the same size so that they cook evenly. 2. This would be a delicious cake for the fall Jewish holidays too. 3. It’s so easy and delicious, you’re gonna make it a lot! Move the rack to the center of the oven and preheat to 350 degrees. Coat a 9” x 13” baking pan. In a medium size bowl, sift the flour, cinnamon, baking soda, salt and nutmeg. Set aside. In another medium size bowl, combine the oil, applesauce, and sugar, eggs and vanilla, and stir or whisk until well combined. Add the dry ingredients and combine well. Pour into the prepared pan, smoothing the top, and bake 45-50 minutes. A tester not near an apple should come out clean. Cool completely and cut into squares. You can lightly sift some confectioners’ sugar on top if you like. Can be stored at room temperature for up to 2 days or refrigerated for up to a week.